RefreshAll Workbook method in VBA is used to refreshes all data ranges and available pivot table reports in the specified workbook. Why we use RefreshAll Workbook method in VBA? 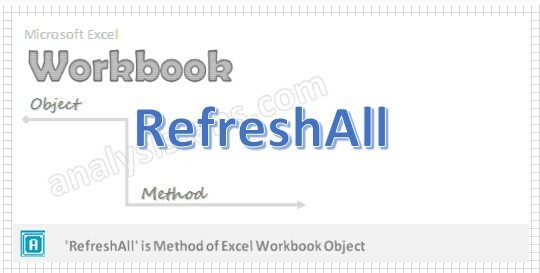 We use ‘RefreshAll’ Workbook method in VBA to refreshes data ranges and pivot table reorts in the mentioned workbook. Here is the syntax to RefreshAll workbook method using VBA. In the above syntax Workbook represents object and RefreshAll represents the method of workbook object. Please find the below example, It will show you how to do refresh entire active workbook. Here is the one more example, it will refreshes the specific workbook. Here is the one more example, it will refreshes the second workbook. Here is the one more example, it will refreshes all pivot tables which are available in active sheet of the workbook. I have a pivot table that uses an table as its data source. In turn, the table acting as the data source is linked to a table in an access database. If I use ActiveWorkbook.RefreshAll I know both the table and the pivot table will be refreshed but is there anyway that I can ensure that the data source table is refreshed before the pivot table that relies on it? Best option is to put the ActiveWorkbook.RefreshAll code line at least twice, so you ensure it doesn’t matter the order for data updates in the related tables. When I open a worksheet data are updated from an external database. after that the pivottables in the worksheet should be refreshed. I have the vba code to refresh the pivottables but the macro for refreshing the pivottables is starting directly by opening the worksheet so before the data are updated. What is the vba code to refresh the pivottables starting after the data are updated?